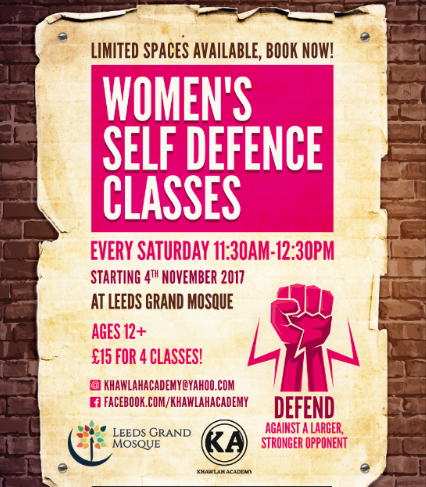 Leeds Grand Mosque is pleased to announce that it will be launching self-defence classes for females only aged 12+. The first session will run on the Monday 19th February 2018, 06:00 pm-07:00 pm. A certified coach will be delivering the sessions. The classes are fully insured and the Coach has a current DBS certificate. . Anyone under the age of 18 must complete our under 18's consent form (form will be sent once you have registered). If you are interested in joining our weekly classes, please complete the form below. Please note, there will be a charge of £15 per calendar month, collectable in advance.